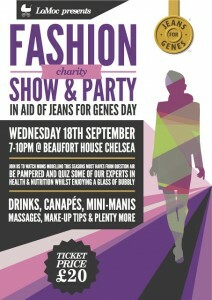 London Mothers Club (LoMoC), the premier events club for mums in London, is hosting a charity Fashion Show and party in aid of Jeans for Genes Day here at Beaufort House Chelsea on the Kings Road on Wednesday 18th September 2013 from 7.00pm to 10.00pm. The event will consist of pampering, bubbly, shopping and a fashion show by high-end London boutique Question Air with LoMoC mums modelling next seasons must haves. Tickets are £20 each and also include drinks, canapés, a goody bag, nutritional advice, beauty expertise, mini-manicures, hand massages from the wonderful Orico organic skincare and much more. LoMoC will be raising money for the charity Jeans for Genes Day & Genetic Disorders UK. On the night some fabulous designer jeans have been generously donated by Paige and will be raffled off as well as goodies from Kiehls, a makover from the make-up station and other items from some fantastic brands. 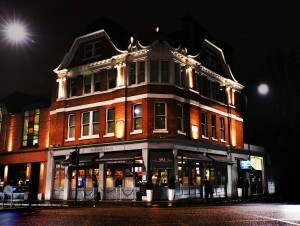 Guests will also have a chance to learn more about the charity on the night.